The Duke and Duchess of Cambridge spent Day 6 of the royal tour in the Waikato region of the North Island. The couple were greeted upon landing. William and Kate split up for different engagements this morning in the town of Hamilton; Prince William spent time at Pacific Aerospace visiting the company's factory whilst the Duchess visited Rainbow Place, a children's hospice. As you all know, the Duchess is patron of East Anglia's Children's Hospices and has taken an especially keen interest in palliative care for children and young people. In her royal role, the Duchess has paid a number of public and private visits to hospices learning more about their work. During the royal tour of South-East Asia in 2012, Kate made a speech at Hospis Malaysia and toured the facility; it's nice to see her incorporating a cause so close to her heart on this tour, too. Kate met children and their families engaged in art therapy and play therapy. She also talked to volunteers and staff about their roles. 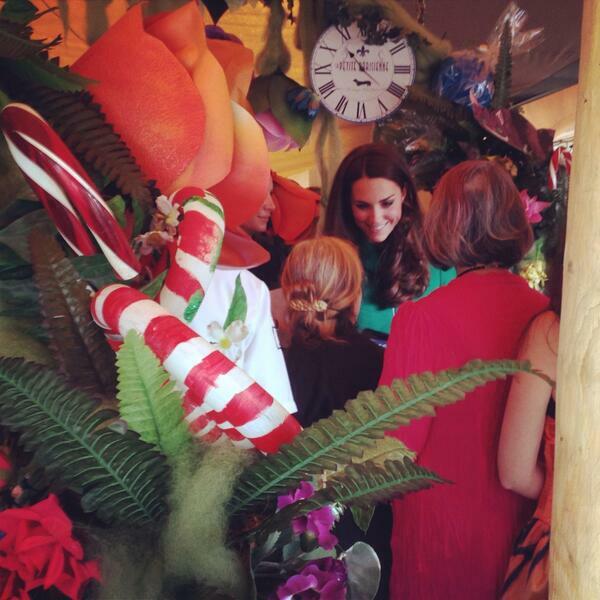 Kate's visit coincided with a children's party, which the Duchess spent some time at. It was hosted in a marquee outside Rainbow Place. 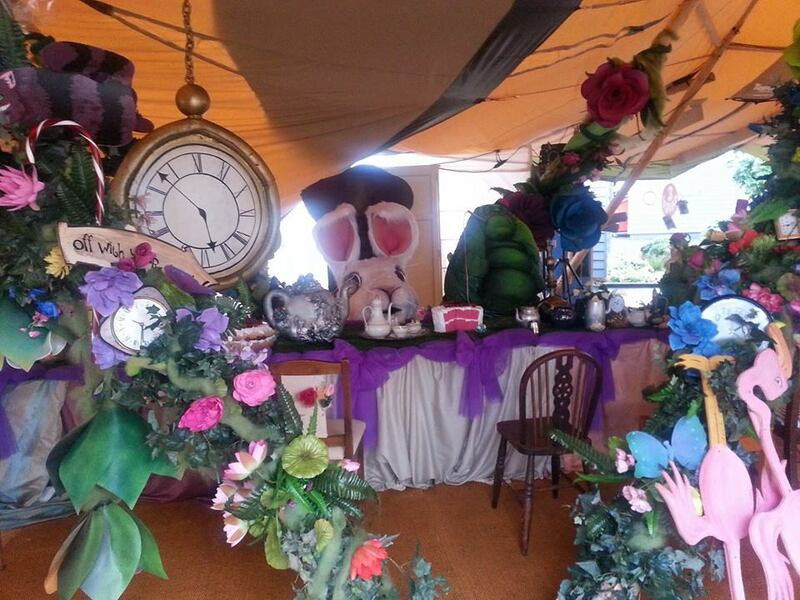 Rainbow Place shared a photo from the Alice in Wonderland themed event in anticipation of the event. Rainbow Place's purpose is to celebrate life in all its colour (I thought it a beautiful description upon reading). They achieve this by helping children and young people facing tough times live life to the best of their abilities. The hospice provides specialist care, therapeutic support and counselling for children and young people affected by serious illnesses. Staff and volunteers carry out their work both in, and outside of, the facility, meaning they're out and about helping children in schools, hospitals and other community settings. I've always felt supporting and highlighting the work of hospices was an excellent choice for the Duchess. People with life-limiting conditions and their families need not only medical support but emotional care, too. Demand for grief and loss services is growing strongly, with the hospice supporting over 512 individuals including 14 sick children and 246 grieving children and young people; of those referred, 65 children were affected by the sudden death of a loved one. One of the key aspects of Rainbow Place is the level of therapeutic support they provide families with through counselling and workshops. Those interested in finding out more about Rainbow Place or making a donation to their cause can find all relevant information on the Rainbow Place website. Concurrently, Prince William visited Pacific Aerospace at Hamilton airport. The company is another of New Zealand's manufacturing success stories. William toured the factory and viewed the P-750 aircraft, which is capable of extra-short take-offs and landings. William met a very excited little girl. 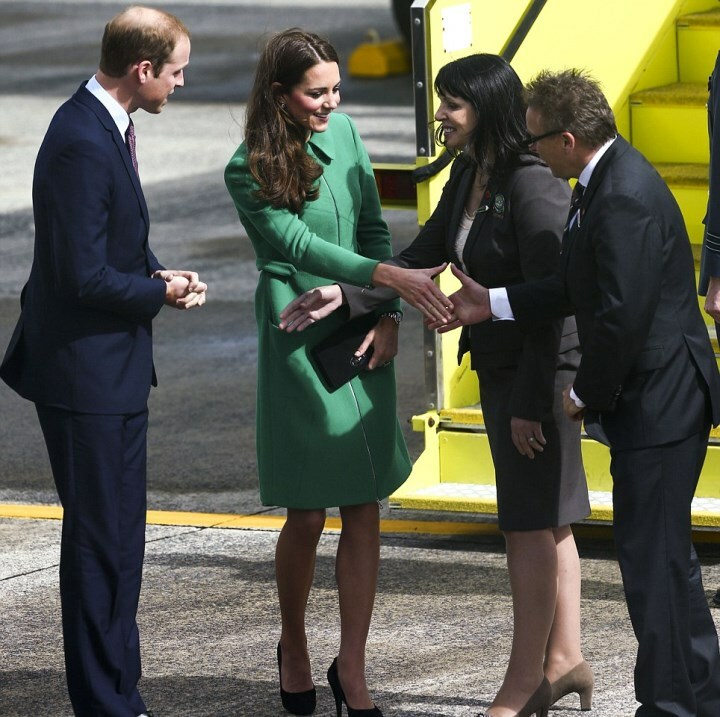 The Duke and Duchess of Cambridge were then whisked to the appropriately named town of Cambridge in the heart of Waikato's agricultural community. The first stop was Cambridge war memorial where they paid their respects, before travelling through the city centre. The residents of Cambridge came out in their thousands to see Their Royal Highnesses. The town's population is 18,000 - police estimate 15,000 turned out today. During the walkabout William and Kate split up to cover both sides. The crowds chanted "We want Kate" and "William, William". William and Kate met dignitaries and enjoyed a 15 minute lunch in the town hall with locals. Afterwards, they travelled to New Zealand's brand new velodrome, called the Avantidrome, which Their Royal Highnesses formally opened. The couple will met a number of New Zealand's Olympic medallists, started races and viewed a BMX display. The Duke and Duchess received a bike for Prince George. The couple also received a cycling shirt for George. William and Kate exchanging smiles. They have a very natural chemistry, it's very much evident on this tour. Kate told a member of the crowd she liked her coat but William thought it was "a bit bright". What do you think of Kate's look today? 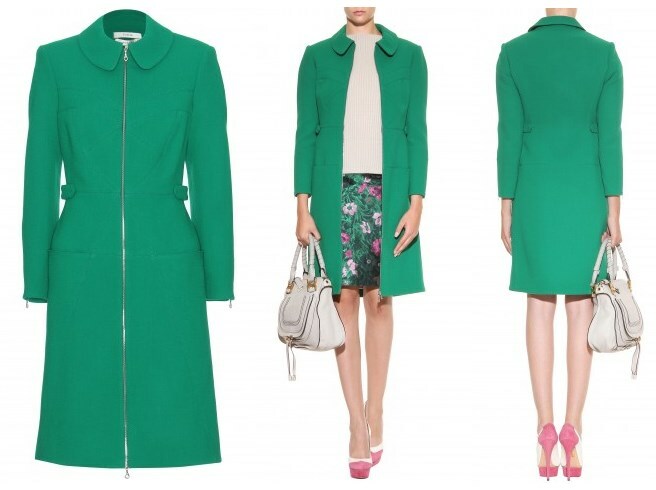 The Duchess looked lovely in the vivid green Erdem Allie Coat (with thanks to What Kate Wore for the swift ID). The flawlessly cut bright grass-green, knee-length coat features a tab-detailed waist, and true to form the designer uses his love of floral prints - this time on the silk lining. The garment originally retailed for €1,824. The coat is from Erdem's Pre-Fall 2013 Collection, but it is sold out everywhere, unfortunately. 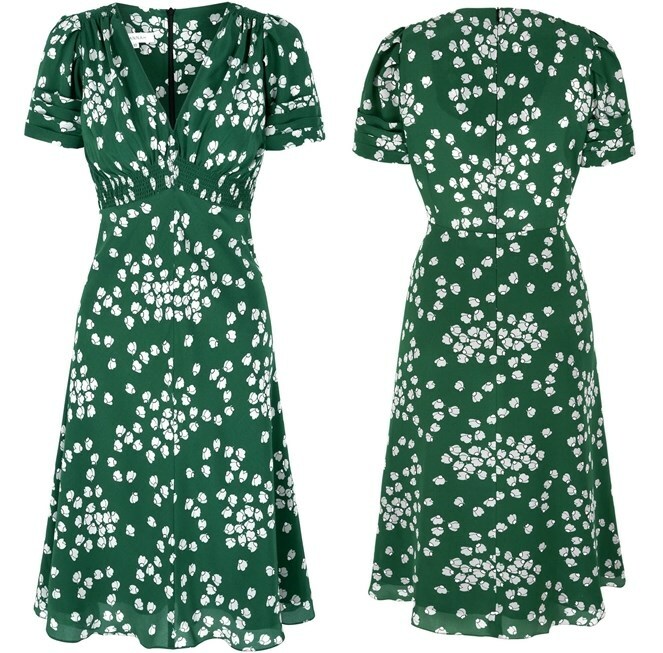 Underneath, Kate wore the Budding Heart Silk Tea Dress by Suzannah (with thanks to Perth Fashion) The £475 frock is based on the brand's best selling 1930s inspired tea dress style. It's described as "a fabulous day dress" with a matt silk crepe skirt part lined in 100% habotai. The smocking detailing at the shoulder and under the bust add a wonderful vintage charm. The British brand is a favourite of Kate's sister Pippa Middleton (which makes me think the sisters coordinated on outfit possibilities; Tory Burch is also a favourite of Pippa's which we saw Kate wearing a few days ago). Princesses Beatrice and Eugenie have also worn Suzannah's designs. We can just about see the dress in this photo. Kate wore her black suede Episode 'Angel' pumps. Kate accessorised with her UFO emerald earrings. 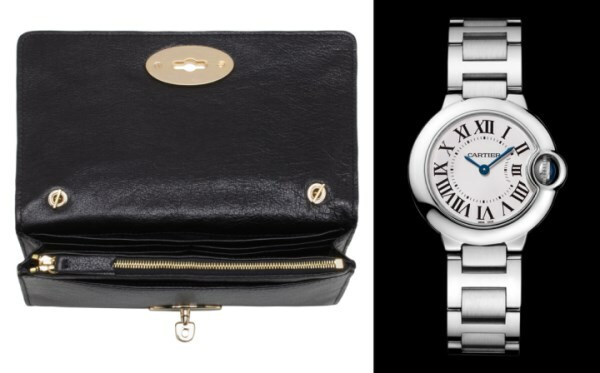 The Duchess completed the look with her Mulberry Bayswater clutch in and her Cartier Watch. When William and Kate left Cambridge, the Duchess was photographed carrying her Longchamp Le Pliage Bag. It's currently on sale in a variety of colours at Nordstrom, reduced from €112 to €89. 3 News has excellent videos and coverage as always. There's also a good one Here and a one minute roundup of Kate's visit to Rainbow Place on YouTube. William and Kate will travel to Dunedin, where they will be welcomed by representatives of the Niga Tahu, the primary tribe of the South Island. Attend Palm Services at the Cathedral Church of St Paul. A public drive to Forsyth Barr Stadium, Dunedin's rugby arena. They will watch rugby, each coach a team and face off against each other. At 2 p.m. The Duke and Duchess will arrive in Queenstown, where they will visit the Amisfield Vinyard. Afterwards they will experience a whitewater rafting trip for aboard a Shotover Jet. They will travel down the river joined by people employed in the tourism industry. They will spend the night at a Queenstown Hotel, George will remain in Wellington with his nanny. Oh god, I am so sorry. This is a major miss for me. My initial reaction is "Ick". I like the dress that she is supposed to be wearing underneath, but something about the coat just doesn't do it for me -- the fit or the color seems off. Strike 1. I agree, i dint like the coat nor the zipper. It looks like a sack with a zipper running in between,IMO. The fit is funny but I like the colour and I love that Kate is switching up silhouettes and trying something new. I don't believe we've seen this shape yet. Go Kate go! Agree -all those seams could make you seasick just looking at it. She can do and has done so much better than this ungepacht mess. Maybe I'm a frumpy 40+ year old. But I loved her coat! Great mix of contemporary design with the zips and with a little 60's flair with the side tabs. There's a 60's feel about Kate's wardrobe so far on this tour. And I'm loving it. Hope she keeps it up! And as for looking like a robe? Almost any coat that is fully buttoned or zipped up, risks that image. We need to remember, it is in fact a coat and both coats and robes are outer garments to keep us warm - therefore will bear similarities. Let's focus on the coat and not the "robe" image. It looks like it has been folded and the zipper doesn't lay flat around her chest and stomach. I looked at it for awhile and figured out that what was off. It fits the same on the model but the zipper is flat making the stitching interesting rather than a mess around a wobbly zipper line. I still like the coat and applaud the choice! I am 42 and I didn't like it. For me, it's the weird stitching on the front, with zippers and the flaps, just too much going on -- it doesn't seem streamlined enough for me. Plus, I think the fit is a bit boxy and hides her fabulous figure. Normally I like green and I like this green better then her green DVF dress. Plus, I think the shade looks good on her coloring, but just as it is, this shade just turns me off, I just can't place it. This is the best outfit so far - finally not one where she looks like a flight attendant or one where she is copying the queen (albeit in a younger version). Every time she has selected Erdem, it's been a win! One more win! In particular cause she' s not copying anyone - just being herself. Keep doing that, Kate! The cut and zipper is fine IMO, but I do think the material is stiff and it doesn't have the best drape to it. Kate has a better figure than this coat allows to shine through. Love, love the coat--color, style, tailoring and length! Great choice! Me, too-- great new piece. So thankful for places like Rainbow Place. The care they give must be so special. The party looked delightful. Was that an Alice in Wonderland theme? What a memorable day this will be for the children, families and staff involved with Rainbow Place. I am intrigued by the hospice concept in the Commonwealth, at least in areas where it has been highlighted by the Duchess. It appears more resources and attention are paid to counseling, support and life-limiting conditions, it appears, as compared to the US model, which (in my experience) really focuses on end-of-life care and limited grief counseling services. I like the expanded concept and think it's a wonderful service. I like the Duchess' look today! The color choice seemed mindful of the party and cheerful inside, too. The Suzannah dress looks like a style we might also see on Carole Middleton? Perhaps I'm associating the cut of it with the dress she wore to visit the Cambridges at the Lindo Wing after George was born? You're right...I, too, thought of Carole's blue dress from the Lindo. Pippa has also worn similar styles. Since they all have a similar body shape, I think it probably looked great on Kate as well. I really liked Carole's blue dress It looked very pretty on her.. Wonder if the blue was coincidence? This has probably already been thoroughly discussed. I'll take all the blessing I can get, but why? Maybe the remark is not meant for me. I don't keep up with gossip sites. so I might have missed something. Or maybe you are actually Carole Middleton, in which case, you're welcome. Lol. I loved the dress too. Absolutely stunning!!! Best so far. I'm speechless. NO, no, no and no! The color is fantastic but the coat. Oh my! would have been much better with buttons. That silver zipper makes it look cheap..
And worse yet, the zippers on the sleeves and who knows where else -being old enough, I can truthfully say it reminds me of clothes in the late 60s and early 70s, and there's a reason they're no longer in fashion. What a fast post like always! I like the green of the dress but i dislike the zipper on front. It is not flattering. But its a special cause and I hope it brings awareness to Rainbow Palace. I think it's more that fit is funny than the zipper, no? Good length but I dislike the cut and colour - but thats ok! That's not whats important. I do like the dress underneath tho! Is it true Charlotte, that she spent 20 minutes at the hospice? Or do you know how long she spent doing that engagement? I'm not certain but from following it via twitter it appeared to be a very swift visit. If it is true that she only spent 20 minutes at the hospice (which I am really hoping is not true) that is very disappointing indeed. Those children deserve so much more of her time and attention...she spent a considerable amount of time yesterday racing boats-a much less important and meaningful endeavor. Again, I am really hoping that her swift visit was actually much more drawn out to give those kids the respect and attention that they are certainly due and were no doubt looking forward to. Someone below mentioned that she could have been delayed flying in during bad weather . . . that might explain the shorter visit. I do wish the news reports were a little bit more clear on the length of engagements. I've seen some reports which say the Plunket playdate was half an hour long, which seems incredibly short to me, more of a photo shoot than a real engagement. Of course, I understand that they have a lot to fit in during the three weeks, and I for one am thrilled to see them out and about representing the Queen. More of the same when they return to the UK, please! Kate's visit to the hospice lasted for 45 minutes. Short visits to hospices (ditto for princely play dates) make sense. The kids in hospice are either sick or grieving. Long events--especially such exciting ones--tire the tykes out. Let's not forget they are there to recover from trauma. Disagree on the hospice visit... they took the time to set up a whole Alice in Wonderland theme and the point is not to be quietly by yourself In these situations. Agree that 8 month olds strangers don't need to be hanging out for very long. Marveling at the opinions who think planning out and shopping for outfits is "work". I feel for all the folks who got themselves dressed today and then put in another eight hours of work. 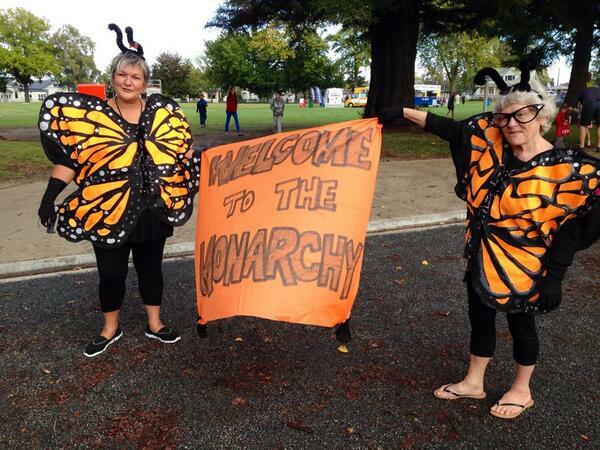 LOVE the Kiwi's butterfly outfits. A nice solid conservative look. I'm a fan of both the dress and the coat, more the dress than the coat. I'd prefer the coat to be unzipped a little at the neck, it just looks a little constricting zipped up all the way. But pretty. Not spectacular but pretty. A nice shade of green and she can recycle this for next St. Patrick's Day at Aldershot!! Thinking ahead, I like it! I think she looks lovely. I have line each of her choices this trip. I would have loved to see that green dress on her. I am a little confused about the coat and the dress. I think the dress underneath, if it is indeed the dress everyone thinks it is, is lovely. Why not show the dress? Does she ever take the coat off? I noticed she did not in the hospice. I'm not sure but I think the designers are released to the press which is how we know what's underneath the coat. She hasn't taken it off. Is there a picture of her in the dress? I liked the color of the coat, but something about the cut seems a touch off. yeah, I love the colour of the coat, but I feel like the cut of the sleeves was just a bit too loose and almost baggy on Kate's slim arms? Maybe she's lost a bit of weight since she last had it fitted? Someone must tell her that she can combine colors. She is always wearing a coat and a dress of the same color--- red coat red dress, blue coat blue dress, the same with the green coat--- it just look so dated. I liked the all green for st. patty's but not the all blue for yesterday. It's hit or miss as far as I see it. Fabulous! She hit a home run!! I love the coat. The length is perfect. As a fellow tall girl, I have such a hard time finding long enough dresses and skirts. Those cute mass-produced dresses at Forever 21 and other like stores just don't do it for me, they are more like tunics! When I do find longer garments, they of course cost an arm and a leg. Woes of the vertically blessed. Charlotte, you are doing a fantastic job! Motivation and dedication are excellent traits to have! I love the green coat and the dress is gorgeous. Kate looks polished and so pretty in this outfit. How did you find out what she was wearing underneath the coat? I must have missed something! Not a fan of the coat, but love the dress. I wondered how Charlotte ID the dress too! Amazing. Thanks again for the quick post. William is so relaxed with children. I love seeing pictures of him interacting with them. He and Kate are a great team! Yes, me too! Thanks for including William's schedule today too, Charlotte. You are the best. Firstly, I think she should have had her hair up in the wind. Secondly, I am not a fan o this coat. Thanks for the great post Charlotte. Hair down or up doesn't really make a difference in this coat for me. My comment above means that the lines of the coat are not better suited to hair up or down like some outfits are. And if she's not holding the baby and has her hands free to sweep her hair out of her face it is less important. It would be tough to have to wear a ponytail at every airport. I also didn't like the zipper or cut of the coat, though HRH looked stunning as always. Not everyone can make a granny house coat cut look good, and she does. But it does really remind me of a granny house coat that my mother wears. Why is it zipped so high up? Is it choking her? I want to see the details of the lining and the dress. I'd like to see a little less formality and a little more interaction with the kids and hospice. Count me among those hoping she spent more than 20 minutes at Rainbow Place. It did look like from royal reporters' tweets that bad weather delayed their landing and held them up at the airport. How much I do not know. I love the Duchess's look!!! Although some may judge, she is held to extreme standards that majority of us will never experience. I think she is doing an excellent job! And looks great doing it!! I hope that she was able to spend more than 20 minutes at the children's hospice for Duchess's sake as this is something that obviously means a lot to her. Being a traveling business woman I know that time is not always on your side. Keep up the great work Catherine!! You look gorgeous!! I don't love it but it's not bad at all. I like it. Good for her for trying something other than the longer coat belted at the waist. She's photographed so much that it's good to mix it up. The colour is lovely and the zipper could be cute and the stitching with a better fit. I usually love all of her looks, but the style of the coat did nothing for her. The large zipper in the front and the lack of shape looks frumpy. Maybe it needs a belt or to be tailored better, it just sort of hangs and gives her no shape. It's a beautiful color and her smile, as always, lights up any outfit. I know that coats are supposed to be warm and all, but I am really not liking the collars of the coats that she is wearing on this tour. The first coat, the Catherine Walker, getting off of the plane, was a home run, but the rest just seem very boring and matronly, in my very humble opinion. A little interest about the collar with a large lapel or a v neck would help. The length has been good, but I think that if you are going to wear the longer lengths that you need to perk things up a bit or else it looks like she didn't get new clothes she just raided the queen's closet and she is far too young to look this old. You can be a princess and professional without being boring and matronly. I'm feeling the same about the black fern dress. Had the skirt been the same length, but a pencil skirt then it would have looked much fresher. The a-line made it look like the queen's hand me down. Someone in an earlier post noted that the Queen's go-to designer's influence was obvious in the wardrobe choices made for this tour. I think that leaving the Duchess to her own choices in matters of dress is best. She has a lovely sense of style that is modern but conservative. Some say boring, but let's remember that she is a woman with a tough job to do. She is not a fashion model whose purpose is to titillate the public with her sartorial choices. And, we should also remember that the Duchess is not our dolly. People will always differ on hair up down and this cut or that one and skirt too short or too long. It's a matter of taste and personal opinion, that's all. None of us will like everything she wears (nor should we expect to). I'm sure if people on this blog who have said they would dress the Duchess better were given the opportunity, the kvetch-fest would not result in endless adulation. Only because of the Internet (and a certain all-too-comfortable anonymity) do we all get to weigh in and kvetch about every little thing. And only because of the Internet do we get these gorgeous streams of pictures from Charlotte's amazing blog. We used to get a couple of shots in a magazine or newspaper days or weeks after. Now we get an almost instant view. Thank you, Charlotte. Your work is a delight from start to finish. I think that dress on the Duchess would be perfection! That green is fabulous! Wish we could see it. Pesky weather! Unfortunately, the coat almost looks like a maternity cut with extra room around the middle and the little side darts to give the illusion of shape. Looks better unzipped on the model. I love the detailing though and I think it could have been perfect had it been a bespoke version tailored to Kate's slight frame. I wonder if we'll see more of HRH in the marquee area? I know they spent a lot of time preparing the Alice in Wonderland tea party and it looked so absolutely wonderful. It would be a shame if they didn't get to show it off much. I know the day was busy, but I thought there would be more emphasis on this particular visit. I thought it was too big also. It loomed like a shapeless sack wish she could hire me I could dress her better than this. Kate needs lipstick soooooo bad. Kate has cleverly worked out her make-up ladies. It is a well known fact by any beautician/make-up artist to emphasise either your eyes or your lips. You're wisest to enhance your most attractive feature and down play the other. Kate has beautiful coloured eyes which we see her line and shade meticulously. She wants her eyes to be her stand-out feature. However her lips are very thin, and to put any colour (other than a natural gloss) on them will make them look thinner. Heavy on the eyes and lips will do her no favours. However, a slightly rosier tint in her lip gloss for evening events would look quite lovely too. Personally, I can't fault her make-up. In my opinion, this pretty dress (I looooove tea dresses) would have called for a cropped blazer in black or white. Why covering it up? And although I like the coat very much, I don't get the combination. The way it is styled on the models is much more inspired. It needs a certain edginess rather then a romantic tea dress. I hope the children at Rainbow Place enjoyed the time with their Princess. I like that she raises awareness for the cause. Maybe she was cold? I'm sure we'll get to see this beautiful dress at some point. Maybe because of the wind? I don't love the style of the coat but I love the print of the dress. Hopefully she will wear the dress in the future with a shorter blazer. I think a white blazer would look lovely with this print in the spring or summer. This green coat looked too big for her. And I think the collar was just like the other blue coat she wore. It needed a different type of collar I think. Also I am nit impressed with her hair dresser. It looks like she could use a keratin treatment and she could use some Lanza oil to tame around top and sleek her roots down more. A quick note to say photos are incredibly slow coming through. We should have plenty of them shortly! The Palace revealed the designers and from videos and screenshots we were able to see the print of the dress. Such a pity, Kate didn't take her coat off. It looks great! Don't mean to start something, but- it seems all her outfits would work well in the first 3-4 months of pregnancy. Maybe she had an eye to the future. Can't you just see Prince William with a little girl.? He really honed in on the sweet little girls and babies. Agree with the concensus on the coat. I love 40's tea dresses and how appropriate for a teaparty, too bad it got cut short. Maybe she can work out time to return? If she was delayed at airport , time had to be made up somewhere. It was a shame it was Rainbow Place that lost out. I am 99 percent sure the Duchess had no choice in the matter. With that banner that flew over about home rule and judging by the drift of local newspapers, there is a strong republican movement in New Zealand. One editorial compared them to celebrities and said Edward VIII was the first celebrity royal. I'd have to think about that. There must be tremendous pressure on William and Catherine to do well I think they are doing a terrific job. Club Med vacay? Sure, if that includes visiting with old soldiers and laying wreaths at tombs. Just to comment on the rupublican movement, I think it is gaining more popularity however today all we saw were thousands out to see the royals and only 3 people holding signs which were aimed at a rupublican point of view and quite honestly quite nastily written about the royals. pregnancy? she was VERY thin in those boat photos. I have just got back from Cambridge. I thought she looked beautiful but have to say we didn't see a lot of her as she was a tad too far away, (even though we were relatively close to the town hall). The coat was a lot more of a bright green, (looks a little minty green on these pics). She looked great and of course the clouds were obscureing the sun making it a little cooler. They were in Cambridge for about 40 mins all up. Including 15 mins in the town hall for lunch and another 10 mins out greeting dignataries and some elderly people. We were on the wrong side for the walkabout which was disappointing. But otherwise a great day and we loved seeing the royals. We did get some pics too. Louise, you are so fortunate! Thanks for sharing your experience. I did notice that people in the background were all wearing short-sleeves, so I gathered that it was not as chilly as it looks. BTW, it's not as chilly as it looks. 20°C at the moment. I really liked the detailing on the coat, the colour and oh that dress! I wish we got to see it on her as it suites her perfectly. The only thing that would of been nice is if the coat wasn't zipped up all the way, otherwise it was a great look and choice! I, too, love the detailed stitching on the coat. I hadn't noticed it in the first few pictures I saw. Hah! Charlotte, at first I thought you were ribbing those of us who had the "are jeans appropriate" conversation with your title. Then I got it! Hahahaha. Charolotte, keep up the great work and thanks for including the links to the charities HRH's are highlighting. Not a fan of this coat at all. It makes Kate look too matronly and frumpy which she is not. Maybe if it were unzipped a bit to show the dress of beneath it would have changed the look. Poor Catherine! If she has a nervous breakdown, will everyone be happy? If you want to criticize someone's fashion choices, take a look at William. Does he only own 2 suits? He really needs a major shopping trip. Who here has indicated they would be happy if she had a nervous breakdown? People don't criticize William's fashion choices because they aren't as interested in him. I have just the same impression of poor William who must have some pices of one style official and unofficial garment in the same colour. He needs stylist! I actually loved this coat except for the "interesting" stitching in the front bust area. I don't think the big pockets were necessary either. The zip in the front actually adds a cool texture which i like. The dress underneath may be beautiful but it's too expensive in my opinion! Overall the Duchess looks great. Now I would love to see her in a printed coat. She's worn enough monochromatic ensembles and enough solid colors. I'd love to see her mix up a bit. Overall the Duchess looks great! 2. Are you ABOSLUTELY certain that she's carrying a suede not a calf leather? I think I'm in the minority - but I loved the coat and the jewel tone was perfect. Typical nz food is probably similar to typical British food but with more vegetables and salad. It is hugely varied and seasonal. We have amazing meat, being a farming nation, with great lamb. We also have a lot of seafood, being an island nation. We Enjoy a good BBQ, the weather is usually a lot better than at the moment, with even winters usually cold but clear and sunny. For lunch it can be soups, sushi, sandwiches, salads, pies, such a variety. We are also famous as the nation who invented the pavlova. A few things on food: just because Catherine is slim doesn't mean that she doesn't eat food. Many slim people make very healthy food choices, and avoid over eating sugar and carbs, which is probably something most westerners should do do become a bit slimmer. She also exercises, Catherine is obviously very fit, so she can probably put away a fair bit. Enough of that. I still think 15 min is a bit rushed for anybody to eat, and they were having lunch with other people as well. As for the Pavlova.. It has an interesting history. The dessert was first made for Anna Pavlova, the Russian ballerina in Perth, Western Australia the 1920's. BUT the recipe was first published in a NZ women's magazine, before the recipe was published tin Australia. So you are partially correct. I think Aussies and Kiwis have to share that claim! But it is a delicious cake, I hope Prince William and Catherine get to taste some! One thing one can be certain of is that the Duchess REALLY loves SUEDE!! I have just returned from Cambridge and have to say that this was not the best look Kate could have chosen. You didn't notice the panel construction work in the front (as you do with the photos) and it was very bright in person. Sadly, it really didn't fit her very well. As you can see from some of the photos, it looked a bit big round her hips and waist which didn't really define her figure. That is something else too. She is sooooooo tiny. Kate stood right in front of me (yep I met her) and she is diminutive (not height wise). Her hips looked like they could be round 33". Kate herself was just lovely. She has a beautiful complexion that the photos really dont do justice. Her hair looked glorious but being down again had 1 major downside. When she was doing the walkabout it obsured her face to those who where trying to take photos of her further down the barriers - such a shame. I also met William and had a lovely quick chat with him. He puts people a ease very quickly and photos I dont think do him justice either. Nothing beats seeing them in person, so if you have a chance as some stage - go for it! What a lovely report Nic! Do you remember what they said to you? Love hearing your experience! Have your feet touched the ground since? Thank you for sharing it with us so we might also feel a part! What fun, Kiwi Nic ! Thank you so much for sharing ! Ahh how great that you got to meet them Nic! Did you have a good time? I asked William if he was planning to come back to Auckland, at some point in the future, to compete against his wife seeing she won the 2 races on the water with team Emirates. Williams reply: "I didn't know it was a race"
So I said "So you let your wife win"
William said "Yes" with a huge grin. With Kate I said: "Hi, thanks for taking the time to come down to see us. I hope you are enjoying being here"
Kates reply: "Yes, we are. Its lovely". The lady behind me asked why they didn't bring George. Kate's reply was that she was so sorry that she couldn't bring him and they would love to bring him back when he was a little bit bigger. There is so much more to say about their little trip to Cambridge. If you have a chance go, the atmosphere is great. I was there from 5.30am (to get a good seat) and just watching the final preparations of cleaning the building; right through to the final bomb search just before they arrive; and then what happens with their security teams when they are on site and their cars; and watching their private secretaries organised what they are doing next - was all facinating and part of an amazing surreal day. Its even been topped off by seeing myself in one of the photos in an above link charlotte has provided. How exciting for you, Nic! Thanks for sharing this wonderful experience. Not many people get "up close and personal" the way you did! Woo hoo!!! So jealous! Thanks for sharing the details! Thank you for sharing your day with us, how lovely. I wasn't sure about the fit of the coat, appreciate your information. I think Kate has been losing weight again, maybe it fit better when purchased. I love the color. It's perfect for a visit with young people who might be feeling sad. Maybe she planned to wear it unzipped but the day was too chilly for her. Everyone who meets them remarks on how kind and natural they are. What a great boost for Britain. I agree, some of these petty criticisms are absurd. The Duchess always seems to be kind and attentive to everyone she meets. I disagree with you and feel sorry you have formed your opinion without really reading the blog to see how much work Charlotte puts into it - it's a wonderful way to learn about the UK and Commonwealth countries for one thing - and that we are free to express our opinions on fashions worn by the Duchess of Cambridge. It doesn't mean we think she's a bad person because we don't care for what she's wearing. Nor do we worship her uncritically. If that distresses you, you probably are right never to read this blog again. It will be your loss. Thanks so much for your feed-back. I only wish you could have all been there to enjoy the day too. If you every have a chance please, go. Just be there really early, sit back, relax and watch. Meeting them is the icing in the cake but never a guarantee. Neeya Mai - My mum and I actually went together and we loved the whole experience. If you ever have a chance - make a day of it and go! I totally agree with Greybird. No one here hates Kate and anything that is said about her, I believe, is not a personal attack on her. Thank you so much for a wonderful blog. Its the first place I go to for up-to-date information on Kate. Thank you for giving us a area in which we all can come together from different corners of the world and comment on something that we all have in common - and interest in Kate, her family and the British Royal family. is kate wearing emerald earings? Charlotte, what about putting the Australian flag in your banner with the koala? It is such a beautiful flag. I'm confused...that is our Australian National flag. What one were you thinking of? Lol with red face--Thank-you, Nerida. For some reason, I did not see the stars before. Just the union flag and I thought it was representing W&C. The Southern Cross is the part I like most. Somebody please tell me the stars weren't originally on the banner!!! otherwise, I might have to check myself in somewhere. I am a fan of the color and coat, but I though it a bit weird that it was zipped up so high. In fact, looking at the photos, I felt a bit constricted. Why not unzip a bit? Who got to see that gorgeous green dress underneath--anyone? Such a contrast to yesterday's casual look. I think she could have unzipped a bit or even all the way, and the ensemble would have been a dynamite smash. Also, are her earrings not her green Kikis? The coat might be zipped up because it's chilly. Someone said that 20 degrees is not cold; however, it's not warm either (especially with the wind factored in). As the Duchess is very slim, she may be one of those people who is chilly more often than warm. Keeping the neck warm is a sure way to look relaxed. The dress underneath is not for us - she is not a model for us to see the dress. If she wants to keep her coat on for the official visit, she should. Philly - 20 degreed Celsius (about 68 Fahrenheit I believe) is a cosy temperature, at least not in our part of the world. It may have to do with the higher UV radiation here down under. I for one was out in a short summer dress all day and I don't feel hot easily. But I agree, very slim Kate may feel the chill very easily. I am not sure about the fabric of the coat, but it could be relatively thin wool crepe which in still a light material. This is the first time I have read this blog. I was told about it by a good friend of mine who is a reader of this blog. She said that is was someplace to come and chat with different people who like Catherine and her fashion. But by reading these comments you could not convice me that you all like Catherine or what she wears. I woudl say most of you have burned her at the post. Some of your terms about her dress or how she looked, like ungepacht mess, frumpy, a granny coat, matronly are just a few. Some also complained about her hair should i tbe up or down, or her dresses are to short or to long. One of you even complained about the gifts that Prince George received. If I am correct in thinking they usually receive gifts from the Country you visit. So what is the big deal that Prince George received a small boat or a new bike, nothing. The ones who are complaining regarding Catherines dresses sound just like Joan Rivers from Fashion Police. Again this was my first visit here and will be my last. I thought I was visting a blog who like Catherine and supported her but all you do here is complain, complain, & complain about something that none of us have any control over. I hope some day yu will all find something you like about Catherine and write about it and have a great discussion regarding it. BRAVO- and very well said, although you said you won't be back so my comment is wasted. I totally agree with you Suzan. And I do hope you will be back again as many of us really like Catherine for what she is and not what we would like her to be. "Joan Rivers"--Ha!! Susan, now, why couldn't I think of that. Please come back. Just ignore the grumblers and read the many nice comments. To be fair, some criticism is tactfully put and does belong here as opinion, but not as the god's truth. Susan, this blog has attracted some negativity lately. I think we need people like you to keep it positive and educate people in how to express a dislike in a more subtle manner. Like you said, it's ok to have a different opinion, but there are words to use that are kinder than frumpy, matronly, messy etc. So please post positive things about these two young royals who are clearly representing their Queen and country AND the future of the monarchy so well. I quite like the coat, inspite of the zippers, but must see some videos to be sure. The actual color seems to be brighter than in the photos. I also agree with RM that it was zipped a bit too high maybe. But I think she looks lovely on this tour. I'm sure the short visit with the children was due to schedule problems and that the Duchess couldn't do anything about it. Wonderful chemistry between them. Really lovely to see how in love they are. Awful cut, fit and style. Her hair looks like she just rolled out of bed. I hope all those posts of Australian and New Zealand designers wasn't just a waste. I'm surprised she hasn't paid respect that way to her host countries yet. Mmmm, I share wills view: that coat isn't my cup of tea! I like this coat. It looks modern and the length hitting at the knee is just right. It doesnt matter that it isn't super form fitting, from what I can tell from the erdem pictures it seems to be the style of the coat somewhat? I also have to say I like shades of green on her. The emerald colour suited her. I just have to say, I was blown away by the Cambridges professionalism and their Teamwork! Take the time to watch the Channel 3 clip where they lay the roses at the memorial from 1:05 to 1:35 or so.Perfect unison! They are slick, I have to say...surely, they must practice this, no? They look like they've been doing this as long as the Queen has been. Amazing....and wonderful representatives. wow. By the way I'd just like to thank you, Charlotte, for putting up all these posts so diligently. It is a joy waking up to a new post every morning! The more I look at this coat the more I love it! Me too. Really excited to see the Sunday Wickstead outfit. Love this look! The green is very on trend and the coat feels more fashion forward for her which is nice to see. I think it's a great combination of modern and classic styling. I don't believe the coat is meant to be super fitted -- it is a bit boxier which reminds me of Jackie O. Well done. Hopefully she will take a few more risks like this and not worry about pleasing everyone with ensembles that play it too safe. She is young, fit, and beautiful, so why not have fun. I like this coat. It's different from the ones she usually wears---with a belt or fitted at the waist. I'm guessing we are going to see bright canary yellow tomorrow. Maybe purple to honor Palm Sunday. These bright solid colors to stand out are the queen's tactic. I believe the Queen usually wears pastels and cream. I think pink and cream suit her best. "Standing out" is not something the Queen would necessarily encourage. There is a difference between standing out and being visible. Do you ever look at the events the queen attends? She often wears bright blue and bright canary yellow. To me here colors are much brighter than the green coat of Kate's. Everyone knows the difference between standing out and being visible but thank you for clarifying the queen's personal position. Nice to have a first hand clarification rather than an opinion. Excuse me, anon 20:55, please re-read my comment. I think, I believe, necessarily are all opinion words. I have no idea what the Queen thinks. The whole statement was meant as tongue-in-cheek, which apparently is lost on some people. KJ, thanks for your input. Again, very bad TIC. It would be nice if she took her coat while sitting at the table with the girl. I know she is in a hurry but showing good manners to a child is important too. I mean we should respect the one we sit with, even when we are in a hurry. It takes only few seconds. The dress is wonderful, but I think the coat is just a little too 'buttoned up' for Kate. Too conservative. The color looks fine on the photos, hard to know how bright it really was. The fashion hit of this post is the dress with the beautiful rainbow the girl at the hospice was wearing. Someone put a lot of effort into making such a special dress! Today Catherine looks different with that coat. I think, I've never seen her in a coat with a zip before. It looks quiet different and it is nice to see, that she wears a new style. I agree with Prince William, who thinks, it is a bit bright. I love the colour, but it doesn't suit her so well, a bit darker and it would be nicer. 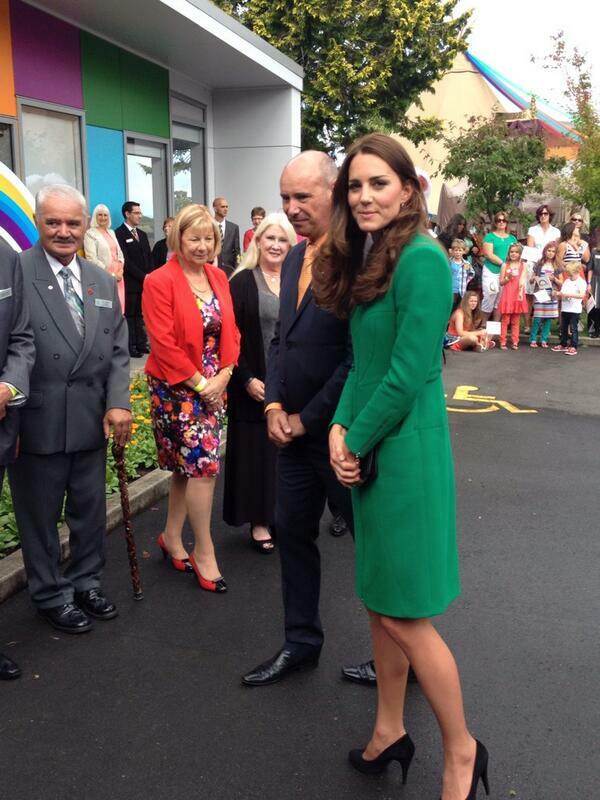 But it's great to see the duchess in green, I do not often see her in green, mostly she in blue or red and so. Green would be a nice choice. I do not like the shape of the coat, maybe it must be more straight or a bit more A-line. The hemline is good. All in all, nice to see she is wearing a new style and that she shows she can wear many different things. The earrings she is wearing show up in other shots iv'e seen in other papers. They are similar to her sapphire ones but smaller. Small emerald surrounded by diamonds. I guess the hair issue has been beaten to death. It looks like William is starting to relax and enjoy these engagements. Hopefully the crowds positive reception of them and joy they seems to be spreading will fill their tanks and they will be willing to do more back in the UK because they have been on the receiving end of some love. New Zealand sure is beautiful. Great post Charlotte! I love Catherine's look today. The color is great on her. Hope we get to see the beautiful dress someday, perhaps with a sweater or blazer instead of a full length coat. I might have added a brooch to the coat......but I guess with her hair down it would have been hidden. I've noticed since arriving in New Zealand, Will and Kate both look very relaxed and at ease. They seem to truly be enjoying themselves. Good for them! Hope we get to George at the zoo in Australia. I love that they are always so genuinely kind and interested in all the children who wait with parents to see the royal couple. I also agree with everyone else, they sure DO have a natural chemistry, I think it's my favorite thing about them. Strange how shes always wrapped in a heavy coat but the baby has shorts on !! Janet, it is not uncommon for boys in the UK and Australia (maybe NZ) to wear shorts all year around. Especially with him wearing a warm cardigan. Legs don't get that cold anyway. Prince George looks like a very healthy baby, he is probably not a cold baby. Today they are down south, and will be doing the Shotover Jet Boat trip. I've done that trip and it's a really exciting ride! I don't think we will be able to see their reactions when the boat does 360 degree spins at speed, but it would make a great pic! By the way, Charlotte, I think I remember that you included this coat in one of your style prediction posts? Am I correct? Such a wonderful wonderful coat!!! That colour looks amazing on HRH, I'm really impressed, beutiful and - new cut for a change. And supporting such a good cause... Wonderful! Great great blog. I do like her outfit today. Pity we didn't get to see her in the dress. I think this is the shortest we've seen her hemlines this trip. Nice. Her smile, her hair and her legs are her most most striking attributes and today they were showcased beautifully. I can't wait to see what she's wearing to-morrow. Great coverage. I so enjoy your blog. I do like Kate's look today, Lovely color, lovely fit. I must agree that it seemed a too big on her. Thank you very much, Charlotte. Sort of a teal blue Emilia Wickstead outfit today. Nice to see her in a NZ designer. Teal. Emilia Wickstead and Jane Taylor hat. New Zealand Herald article said she wanted to stay longer at Rainbow House, but security was getting "tetchy." It is a lovely article.